Build upon the legacy of our famous nEar05 models, the new aktiv 05 near field reference monitor take professional level 5″ near field monitoring speakers for the entry level to yet another level. The monitor boasts an ultra-flat low frequency response with its newly designed larger silk dome tweeter and the top quality kevlar 5″ driver delivers unparalleled punch in the low-mid frequency – a major improvement over the paper and polypropylene drivers used in most comparable products. ESI was the first vendor using kevlar for studio monitors in this price range as material inside the low frequency driver. Other vendors have since copied our idea, however there is much more to excellent sound of aktiv 05. A new tuning of all components by our engineers in Germany and the use of the completelely new crossover design, turn aktiv 05 into yet another milestone in the ESI studio monitor legacy. Many monitoring setups contain a subwoofer as an essential ingredient. 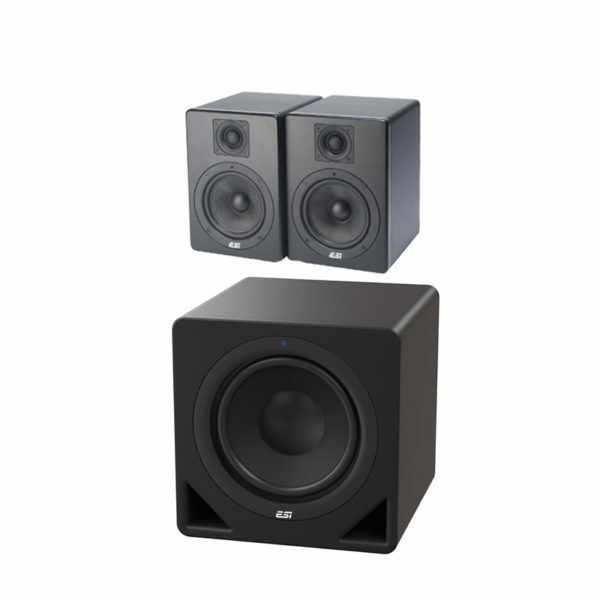 Although many studio monitors such as our aktiv 05, uniK 04 or uniK 05+ for example, provide sufficient bass frequency response for many applications, adding a aktiv 10s subwoofer will help you to provide a much better picture of the low frequencies in your mix. Wheather you are producing classical 2.1 sound or 5.1 / 7.1 surround sound productions, aktiv 10s will easily and quickly become an important part of your monitoring setup. It’s compact size with a stylish design, yet powerful output will easily convince you.